The enigmatic brides-to-be in paintings by Cui Jin seemed wrapped in crinkled cellophane, like gifts that have been opened, crumpled, and re-packaged. Two full-page color illustrations of her work are included in the definitive catalog, “2007 Chinese Contemporary Art Document.” Their elbow- length lace gloves as well as the fringed shawl covering their heads traditionally are red, symbolizing joy, long life and celebration in Chinese weddings. In some ceremonies, the bride wears the shawl over her head until she is formally presented to the groom’s family. 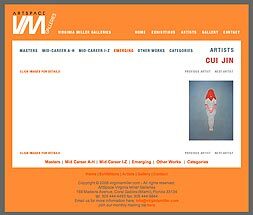 Perhaps the response to Cui Jin’s mysterious images, like that of music, poetry and abstract art, lives within the perspective of the viewer.